All rooms at Cap Roig are elegantly decorated in neutral tones and have views of the sea or mountains. They also feature a balcony, satellite TV and a private bathroom. Guests can enjoy a barbecue-buffet on the poolside terrace at lunch, with spectacular views over the Mediterranean Sea. There is also a buffet breakfast and restaurant for dinner. 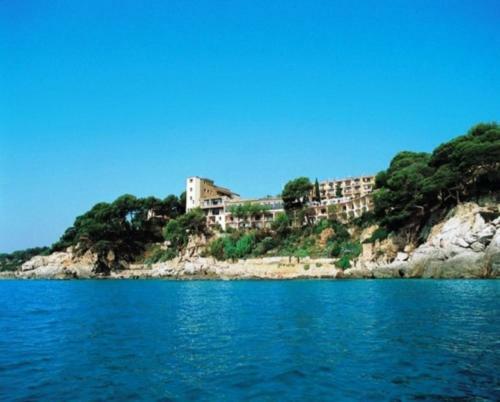 Hotel Cap Roig is 30 km away from Girona. It is a 15-minute drive from the charming fishing town of Palamós with many bars, restaurants and cafés. General atmosphere and layout. Due to the volume of guests the buffet for meals worked well. Good selection of food. Excellent room view with balcony (requested on booking) Spa with facilities. Parking was rather tricky as there seemed to be lots of coming of going. We had a small dog booked in and that was slightly difficult as there is absolutely no provision for a toilet/exercise area either within the confines of the hotel or anywhere outside in the surrounding area. The beach areas (all are off limits to dogs) which we understand, however the reception informed us that we could go to St.Felix de Guixols next to the harbour beach where she would be accepted, however this proved to be incorrect as we were turned off the beach there. 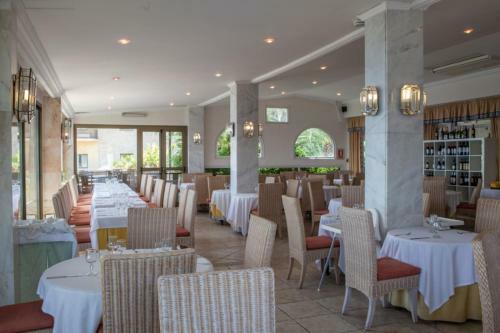 The location, friendly staff (especially the restaurant's), the pools and accessibility to ocean and the children playgrounds. The idiotic 80's live and recorded music blaring at top volume every night makes it impossible to sleep (or even read or watch tv). 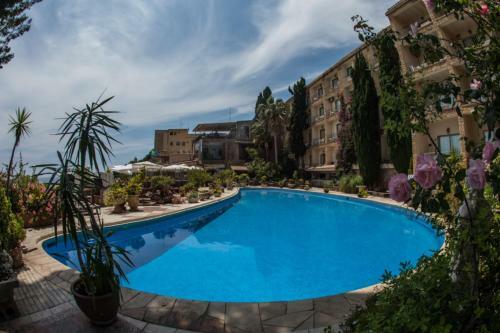 It is impossible to escape it, as it is set by the pool, and the rooms are built around it. First night, we even tried to enjoy it from our balcony. By the third night, our child was crying, frustrated at being unable to sleep. Even if you enjoyed it, how many times can you listen to the same abba, Stevie Wonder songs, etc by an old wanna be musician with recorded back-up music. And a synthesizer, night after night? They would not at least lower the volume, even when there was no audience! It completely ruined it for us and every other parent we met. One family left a day earlier. Such a shame. They could move the music to one of the several salons with ocean view or keep the volume down, but they would not listen. It's a night hotel otherwise, but we are never going back. The parking is a nightmare, since there are only a few spots within the hotel. You need to park elsewhere and walking by a road without sidewalks is dangerous. The view from the hotel's bar is spectacular. There is very limited parking at the hotel. It took us 30 minutes to find a spot. Extremely frustrating. The beach is nice but tiny. Lots of rocks, maybe tricky for kids. The branch is low quality, you can get better food in the city. Everything ! The location was amazing , the amazing sea shore of the hotel . The room with the beautiful view ,i cant ask for better! It was just wonderful. The surroundings, the view directly on the see, very large room. I can recommend this hotel if you search something to relax, to spend the great time during the summer near the sea. The hotel was in an excellent location right on the beach. The rooms were nice and clean but at the edge of getting old and run down. The breakfast and dinner is not at a very good level. Both in terms of food and of service. The breakfast particularly is poor and the restaurant is expensive and not a the quality the price would ask for. The location is nice with a great view on the rocks and the see. Check in was friendly. Although the hotel its self and its location is fantastic it is a pitty that the restaurant and the bar is not having the same quality. Service is chaotic and stressed by None spanish employees. Otherwise the hotel would have easily 4 stars! I think allways. Very good hotel: place, food, see, view from the room. Location is great. Staff very friendly. Food and service excellent. Staff on reception especially older lady and Suzanne in the bar very helpful and pleasant. Very relaxing when you arrive and throughout the stay. Views and surrounds/garden wonderful. Would definitely go back. Young staff in restaurant all nice. Waiter in restaurant for lunch when we arrived on 17th June had very poor skills in making us feel welcome. Never smiles etc. Good waiter though just needs talking to. Bad smell of damp in hall way and in our room no.104 throughout our stay. Had to have doors of room open or smell was overwhelming. Breakfast choice virtually the same every day. The hotel is very nicely decorated and the garden/pool area are exquisite; it gives a much more homely feel that the usual fair. The staff is helpful and friendly and they put an effort into feeling you welcome, welcome cocktail included. We also forgot a pair of glasses in the room and they insisted in tracking us down (phone, email) to let us know. they hadn't noticed that we had a reservation for an extra bed in the room, but they solved the problem very quickly. El unico inconveniente que veo es el aparcamiento. Demasiado pequeño para tanta gente. Décor des chambres vieillot, chambres dites supérieures en fait peu spacieuses pour un prix élevé: 157€ pour une nuit. Le directeur nous a mis à une table près de la piscine pour dîner seuls et au calme pour nos 44 ans de mariage! Nous avons fort apprécié. Il y avait deux congrès. Ceux-ci occupaient tout !! Enormément de bruit. Peut-être s'il y a un congrès,ne pas mettre les personnes individuelles près des congressistes. Tillgång till SPA-avd var gratis! Buffe-lunchen mycket bra! Vue sur la mer, plage très agréable. Diner avec assez peu de choix contrairement au petit déjeuner. Жили в отеле во второй половине сентября в улучшенном номере с видом на море. Номер просторный, есть гардеробная и холодильник, что очень удобно. Отель находится в одном из самых живописных мест Коста Брава, есть выход на 2 немноголюдных частных пляжа с чистейшей водой. Потрясающие виды из номера. Качественные завтраки и ужины на террасе с видом на море. Хорошая работа официантов в ресторане. В интерьре отеля присутствует множество старинной мебели и аксессуаров, что вносит очаровательный колорит. Совсем запущенное СПА (практически ничего не работает), видимо поэтому и бесплатно... Хотя массаж был сделан качественно. Ехали в отель, ориентированный на взрослое поколение, а приехали просто в "молодежный лагерь". Одновременно с нами в отеле жило порядка 100 студентов из Германии. Персонал отеля ничего не делал для того. чтобы разграничить потоки отдыхающих. На ужин стояли толпы голодных студентов (или школьников). Было не очень комфортно. Ресторан неплохой, учитывая красивую террасу с видом на море. Нормальная сервировка и качество блюд, но при этом нет вечернего дресс-кода на ужине (наряду с нормально одетыми отдыхающими, толпы студентов в шортах и майках). Видимо эта категория гостей была более интересна отелю. Но за то, что отель расположен в самом живописном месте на побережье, наверное это можно простить. Очень красивый вид из номера (если с видом на море). Хороший пляж. Приветливый персонал. Если брать машину, то до Барселоны можно добраться за час. (Дороги платные, но очень хорошие). Бесплатная парковка. Выход из отеля на пляж закрывается в 20:00.
het steeds moeilijk om aan het hotel parking te vinden. Ubicación, vistas, comida, I limpieza en general. Considero que la ubicación del hotel I su estructura merecen una mejora de todas las instalaciones en general..piscina...spa...habitaciones...etc.... La palabra sería una restauracion sin perder su encanto. Великолепное месторасположение. Вид из номера на море, сосны , скалистый берег . Тишина и спокойствие данного места . В тоже время рядом отличные портовые городки с шопингом, ресторанами и развлечениями. (5 мин на машине ). Очень вежливый персонал, хорошая кухня. Есть парковка. Грусть расставания . Хотелось бы подольше оставаться там ! Die Lage des Hotels ist einmalig, auf einem Felsen über zwei Buchten gelegen mit einem herrlichen Sonnenaufgang. Auf der Strassenseite ist es abgegrenzt durch einen schönen Baumbestand mit den Parkplätzen mit einigen kühlen Schattenplätzen und einem kleinen Kinderspielplatz. Frühstück- und Nachtessenbuffet haben eine gute Qualität und sind abwechslungsreich. Auf der Rechnung sind nur noch 3 Sterne aufgeführt, während das Cap Roig bei Booking und am Eingang noch mit 4 Sternen klassiert ist. Die 3 Sterne entsprechen etwa den Einrichtungen, wobei der Preis dann nicht mehr stimmt. Das Zimmer (Superior, oberster Stock Sicht aufs Meer) war für uns gross genug, brauchbar eingerichtet mit einem ganz kleinen Balkon. Die Klimaanlage funktionierte gut (auch wenn wir nicht im Zimmer waren). W-LAN (g) funktioniert im Zimmer und an der Reception. N geht auch auf dem Balkon. Halbpension kann man entweder als Mittagessen (Grill am Pool) oder als Nachtessen Buffet am Pool und bei schlechtem Wetter im Ess-Saal einnehmen. 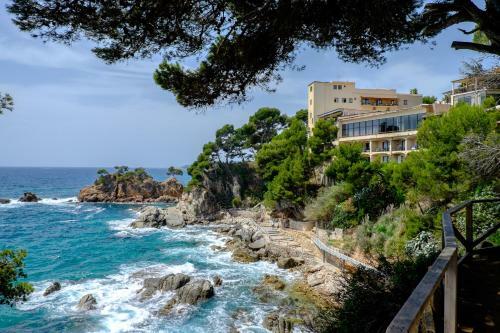 Offenes W-LAN gibt es auch am Strand (insbesondere im Palamos) und in vielen Restaurants Wir kennen die Region und haben das Hotel wenige Tage vor der Abreise gebucht. In der gleichen "Zwangslage" würden wir vielleicht das Hotel wieder buchen (Zimmer und Essen waren für uns gut), auch wenn es verschiedene Punkte gibt, die nicht stimmen (Personal, Preis, Sauberkeit, Einrichtungen Pool). Am Meer kann man Liegestühle und Sonnenschirme mieten (je 10 € pro Tag) oder eigene mitbringen, die man am Hoteleingang vom Meer deponieren kann. Es gibt eine kleine Bucht, die auch für kleine Kinder geeignet ist. Das Personal am Empfang und im Service ist äusserst unfreundlich und wenig professionell, mangelhafte Sprachkenntnisse (ausser spanisch kaum englisch oder französisch, deutsch haben wir gar nicht versucht). Das Servicepersonal ist zerstritten und wird von Machos dominiert. Wir haben zwei grössere, laute Auseinandersetzungen erlebt nach denen jeweils ein Dame mit Tränen in den Augen die Arbeit wieder aufgenommen hat und die Machos triumphierende Worte und Blicke ausgetauscht haben (in beiden Fällen waren auch der in andern Berichten hochgelobte Said und der Chef de Service Adrian beteiligt). Die Einrichtungen am Pool (Kunst-Ratta und Pflanzen) sind schön fürs Auge, aber wenig praktisch und verschiedentlich reparaturbedürftig. Möbel und Boden sind sehr schmutzig (Vogelkot). Es gibt keine Sonnenschirme und kaum natürlichen Schatten. Das Geschirr im Restaurant ist oft noch schmutzig. Wir haben noch nie in einem Hotel erlebt, dass man eine Getränkekarte explizit verlangen muss. Bei der Ankunft kriegt man wenig Informationen. Es wird eine Mappe abgegeben. Die besteht aus 1 Blatt Mahlzeiten auf französisch, obwohl wir am Empfang englisch gesprochen haben, 1 Blatt Spa und 1 Blatt Hotelbewertung. Das Hotel hat kein Restaurant (Booking informiert falsch). Das Mahlzeitenblatt schreibt, dass man anstelle des Buffets ein Tagesmenue oder à la Carte essen könnte, was aber beides auch nicht stimmt. Parking ist gratis, die Plätze sind aber sehr beschränkt, da sie auch von Strandbesucher genutzt werden, die mit dem Hotel nichts zu tun haben. Das Hotel ist nicht geeignet für gehbehinderte Personen, da man zum Restaurant und zum Pool nur über recht schmale Treppen kommt. Kinderwagen muss man dort tragen. Wir haben noch selten ein Hotel erlebt, das in keiner Weise erkennen lässt, dass sich ein Gast hier wohlfühlen sollte. Der Pool ist nicht geeignet für kleine Kinder (1 Becken, Tiefe ab ca. 60 cm). Ubicación privilegiada en un entorno de naturaleza increíble, además de estar muy cerca de poblaciones como Playa de Aro y Palamós. Necesita una buena reforma, principalmente en su fachada y debería adaptarse para clientes con minusvalías. El aparcamiento es insuficiente para la capacidad del hotel. Las vistas, la tranquilidad, el acceso a la playa, la comida. La decoracion de las haabitaciones, instalaciones antiguas. le mobilier et la deco un peu defraichi...le parking trop petit...rien de tres grave en somme!!! El hotel en general es correcto, pero creo que necesita más mantenimiento ya que algunas zonas están un poquito abandonadas. La zona del hotel es muy bonita y la playa tb. El menú muy correcto. El agua de la piscina climatizada estaba fría, el primer día lo comentamos y lo que no me gusto es que nos hayan dado largas. No fueran sinceros, que ya habían subido la temp.y finalmente había un aparato roto que vendrían a arreglar. El último día antes de irnos toque el agua pero estaba tibia y no como debe de estar en una piscina climatizada, no me gusto que los empleados no fueran sinceros. 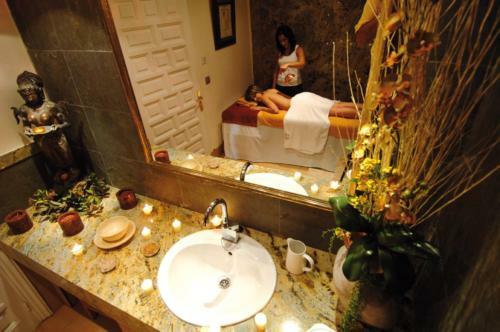 Y otra vez vuelvo a repetir lo del mantenimiento en el spa, ,habitaciones y hotel en general. Hotel muy familiar, nada de gente joven haciendo ruido, gente con ganas de tranquilidad y muchas familias con niños. Buena ubicación aunque el acceso a la playa con un niño muy pequeño no es muy fácil. El buffet libre muy variado y de calidad. La piscina siempre estaba vacía y tumbarse por la noche en las hamacas oyendo el mar una delicia. La zona de tiendas de Platja d'Aro a 20 minutos a pie o 5 de autobús en la puerta del hotel aunque la cadencia deja que desear. En resumen un buen lugar para pasar unos días y sobretodo relajarse con o sin niños. Plazas de aparcamiento. Tuvimos la suerte de aparcar dentro del hotel y decidimos dejar el coche y caminar o coger el autobús por lo complicado del aparcamiento. El acceso a las dos calas se hace mediante ascensor y después un trocito de camino de ronda, apenas 250 metros pero hay escaleras y subidas y bajadas pronunciadas. Le séjour s'est très bien déroulé : vue sur la mer à couper le souffle, petit-déjeuner très copieux, demi-pension très variée, personnel charmant. Excelente comida, lugar privilegiado sobre el mar, decorado con gusto. Profesionalidad hotelera. étant donné que" c'est la seconde fois que nous séjournons dans cet hôtel, il n'y a eu aucune surprise. Nous avons retrouver les mêmes qualités que la première fois. Hôtel très accueillant, joli décor, situation magnifique sur le rocher, personnel très poli et compétent. Tres bon séjour. De bediening in de bar ah zwembad: onbeschoft. Niet van het niveau dat je mag verwachten van 4 sterren. Jammer. Le cadre seuls avec la mer en décors !!!!!!!!! !Loin de la civilisation et pourtant si près !!!!!!!!! Un petit paradis et une table excellente !!!! Merci je viens très très régulièrement car pour moi c'est le maximum de tout ce que je recherche . Dificultad en el aparcamiento del coche, en el primer sitio me multaron y en el parquin del hotel me encontré con dos ralladas en la carrocería. El servico de restaurant muy pobre en la diversidad de la comida,muy pobre en servicio de personal. sobre todo la atención del personal fue excelente. Las instalaciones importantes muy bonitas y con bonitas vistas. las camas son inmensamente incomodas. La limpieza escasea en cuanto habitaciones mucho. Lo que no esta visible a simple vista, no esta muy cuidado. Mucha humedad y basura. Les seves vistes impressionants i la seva piscina. Muebles viejos, aspecto descuidado en casi todas las instalaciones..por ejemplo, hay un área de spa que podría ser de 10 si todo funcionase y estuviera más limpio. Lo mismo se puede aplicar a habitaciones, restaurantes, y todas las instalaciones en general. Las vistas desde todo el hotel son fantásticas. Desayuno correcto en una terraza sobre el mar. Un hotel con mucho encanto. La comida muy buena y el personal muy atento y amable. Estuvimos en una habitación superior con vistas al mar realmente bonita decorada con muebles antiguos (no viejos). El jacuzzi no resulta muy práctico en el baño bastante reducido de la habitación doble superior con vistas al mar, que en realidad, eran más bien vistas a un rincón de la terraza de la piscina. Hay otras habitaciones con una vista mucho más directa a la costa.Se trata de pedir la adecuada y fuera de tem`porada o temporada baja. El parking resulta totalmente insuficiente para la cantidad de clientes que tiene el hotel, sobretodo en agosto. le parking un peu petit il suffirait de l'agrandir à la place de la pelouse. les chaises longues il manque des coussins. la vetusté de l'hotel tres vieillissant,et le bruit.Aucune insonorisation!! hôtel très bien situé personnel agréable la vue sur mer magnifique la nourriture est très bonne..
Hôtel un peu Veillot le spa est très salle dommage !!!! Le personnel, ambiance généralement calme. 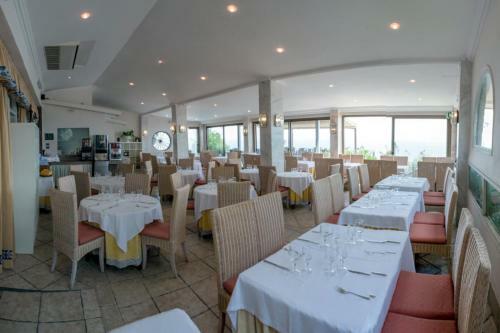 Nous avons appréciés l'accueil de notre arrivée à la réception, chambre spacieuse avec beaucoup de rangement, le personnel des restaurants sont aimables et attentifs, la piscine est trés bien et assez grande. La décoration de la chambre est un peu vieillotte, l'hôtel est pas facile à trouver et surtout dangereux pour les balades à pieds jusqu'en ville...parking voiture pas assez grand pour beaucoup de voiture...par contre énorme problème avec le massage rapport qualité prix très mauvais, masseuse pas du tout aimable et massage très désagréable j'en suis presque à avoir des bleus...premier massage pour ma part et grosse très grosse déception. Me gusto mucho el personal , muy simpático y buen humor me gusto su emplazamiento, sus vistas , su comida ,buen buffet, sus noches de música en vivo , su servicio de masajes en el spa . La ubicación es excepcional con buenas vistas y con una cala debajo del hotel fantástica. Es un hotel un poco antiguo, más bien casposo en su decoración. poc,molt poc personal. La majoria sense qualificar i magrebí que ni tan sols parlàvem el nostre idioma. Manca de manteniment. Mobles de la nostra habitació vells. TV antiga que pràcticament no es veia.Cap diversió a la nit tret d'un senyor que portaba un equip i que repetia sempre el mateix. Espais tancats (ex. bar de recepció) en ple mes d'agost. Las vistas a la costa desde el restaurante y la piscina, o desde la habitación si las tiene. El bufette por su variedad y sabor. Acceso a la cala. Hemos quedado encantados con la ubicación del hotel y las vistas desde nuestra habitación, en cuanto a los servicios bien y la comida para ser buffet libre también muy bien. Abarrotada de mobiliario la piscina. vistas espectaculares. Personal de limpieza muy amable y simpatico. mal servicio al cliente, pesima atencion en bar y restaurante. parece que el cliente fuera una molestia. El hotel esta muy descuidado, no volveria! L'hôtel est idéalement placé, surplombant la mer avec une vue imprenable. L'accès aux criques et plages semi-privées de l'établissement est facile et rapide. La restauration est de très bonne qualité et assez diversifiée. Le barbecue en extérieur, près de la piscine, pour le déjeuner, est notamment très appréciable. Le personnel est très aimable et attentif à vos requêtes. Bon point: les boissons sont à des prix très raisonnables. Bien qu'intéressant, l'hôtel vit de toute évidence sur les restes d'un passé certainement plus glorieux. Les quatre étoiles annoncées sont loin de faire l'unanimité car les installations et autres infrastructures, quoique nombreuses et intéressantes, montrent en effet de sérieuses lacunes avec un manque évident d'entretien. Certaines chambres, plutôt humides, sont même à éviter. Une rénovation d'ensemble s'impose ! pour une seule nuit,la chambre etait a cote du restaurant donc ambiance musicale soutenue jusqu'a minuit! Hotel muy completo. Muy bien situado en zona tranquila pero cerca de todo. Vistas excelentes que se ven tanto desde la habitación como desde la terraza del comedor como desde la piscina. habitación sin aire acondicionado. La ducha no funcioaba bien. El Lavabo atascado. Una bobilla no funcionaba.